Three weeks ago we restored the mass air flow housing back to factory form by removing the Internet Racers Supply ported unit and replacing the factory unit. Testing showed us that the knock retard problem was not because of the ported unit. So we are down to the last modification, Hypertech Power Programmer III, minus the two whisper pulleys. Jack removed the aftermarket programming and programmed the computer back to factory form. He then put 150 miles on his car before this test began. It was a cool September afternoon with plenty of clouds to keep it that way. The weather could not be more suitable to eliminate any knock retard caused by the extremely hot days we experienced in the past. The intake air temperature was around 82 °F and the engine coolant temperature hovered around 186 °F. Testing in hot weather and then testing in cold weather is not the *best* way to perform the test, especially when dealing with knock retard. Try to keep your testing environments as close as you possibly can to ensure a good test. However, it is not always necessary or possible to do that. 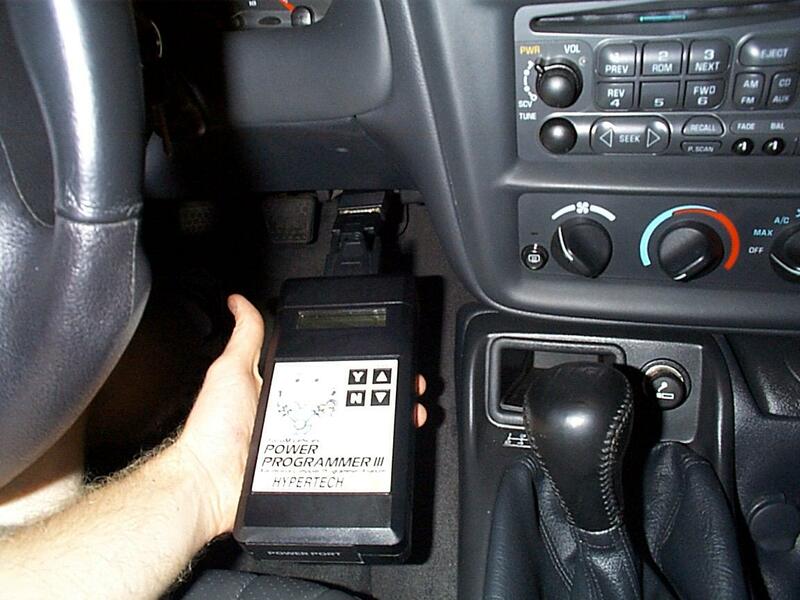 The Hypertech Power Programmer III is a hand-held computer that takes the place of the "chips" people put in their car's computer to make the car run better. The Hypertech unit attaches via a cable directly to the same module used with a Tech 2. The Hypertech unit offers various options which you can use to reprogram your factory programming. The number of options range from tire size, gear size, to power tuning. The power tuning is the big seller for the average Joe who doesn't even know that aftermarket parts exist for these cars. The power tuning adds approximately two degrees of timing and increases your cars horsepower, at least that is the claim made by Hypertech. This has been known to increase or create knock retard in some cars. Why? Some cars accept the programming without creating knock retard and some cars do not. By this time we had this testing down to a science in itself. Jack can hook up the cable to the car blind-folded, while I run the cable across the cup holder so it does not interfere with Jack's shifting. Within 30 seconds we were ready to roll and start the Auto Tap logging. The first run we made looked exactly like the previous Auto Tap logs. At 3,000 rpm's the knock retard showed up like an unwanted guest. The only difference in this run compared to the runs on previous test days was a very distinct "miss". We noticed a miss during the short run through the gears. This was the case in the next two runs but was less distinct as more runs were made. All you can do is shrug it off and hope that it was caused by the computer not having enough time to adjust properly from the removal of the power tuning.